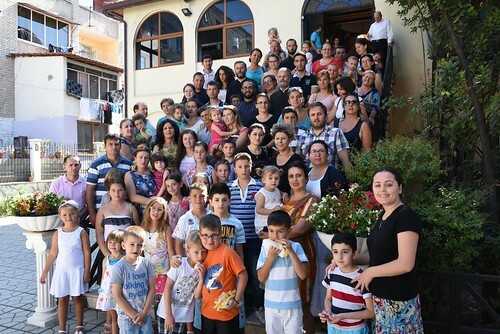 Twenty four families participated in this year's family camp held in Elbasan, Albania. The camp was led by OCMC missionaries Nathan and Gabriela Hoppe together with Dn. Stephanos and Alexandria Ritsi and members of the Central Children’s Office. "Celebrating the Orthodox Family" was the theme of the family camp held in Elbasan, Albania, on July 27-31, 2015. The camp was organized and led by OCMC Missionaries Nathan and Gabriela Hoppe, assisted by Dn. Stephanos and Alexandria Ritsi, together with members of the Central Children’s Office of the Orthodox Church of Albania. The program featured parallel activities for the parents and their children. There were also times of fun for the whole family to be together, including excursions to Gjinar or the swimming pool. One of the highlights for the parents was the ad hoc volleyball games in the afternoons. In this camp, twenty-four families (75 persons) had the opportunity to envision their future by looking ahead at their hopes and dreams for their families. Looking back at life in their families, they had the chance to examine the things that brought wholeness or brokenness in their lives. They understood that every family has its own challenges, and what is important is to understand the positive and negative experiences in one's home. Families were encouraged to continue healthy family practices and to let go of other practices that are not healthy. They were able to reflect on things that brought joy into their lives and things that caused sorrow, and how these things that bring joy are reasons to be grateful, but what brings sorrow is an opportunity to either offer or ask for forgiveness. The families also saw that in our homes there is a need for space for love and grace. Our homes should be places where positive constructive discipline is offered. Participants also reflected on those things that made the foundation of their homes strong and things that made the foundation of their homes weak. They were encouraged to take concrete and practical steps that will strengthen the foundation of their homes even more. Looking at some of the families in the Scriptures, but also at their personal lives, they understood that God is able to transform their broken families and to use them for His glory, as He did with the broken families of the Bible.